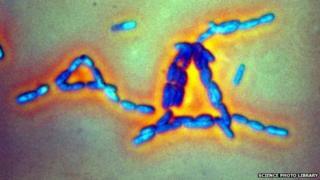 A lab in the UK may have received a sample of live anthrax from the Pentagon in 2007, say US officials. The lab - which is not being named - is run by UK personnel, not the US military, said Colonel Steve Warren. "Another lot came up positive and that lot had sent samples to the UK and Massachusetts," the colonel said, referring to the deadly bacteria. It brings to 68 the number of labs involved in the anthrax scare from the US, including four foreign countries. A number of US military facilities for the past decade have shipped inactivated anthrax samples to labs around the world to help their research into biological warfare. But in recent weeks, it has come to light that some suspect samples were not properly de-activated before being posted. After Tuesday's briefing, Col Warren told the BBC they could not be sure the UK received the live samples but it was sent samples from a larger batch - Lot 5 - in which some of the bacteria was found. Staff members at some of the labs have been treated for anthrax exposure as a precaution, but no-one has fallen ill. In addition to labs around the US, suspect samples were sent to facilities in Australia, Canada, South Korea and the UK. Experts in bio-safety have heavily criticised the lapse and called for improved precautions. Symptoms of anthrax exposure include skin ulcers, nausea, vomiting and fever, and can cause death if untreated. The Pentagon has maintained there is no risk to the general public. Not all will become ill when exposed to anthrax but left untreated, anthrax illness can turn very serious or lead to death. Anthrax entered the US national consciousness in 2001, when shortly after the 9/11 attacks, letters containing powdered anthrax arrived at news organisations and the offices of US senators. Twenty-two people were affected and of those, five people died.